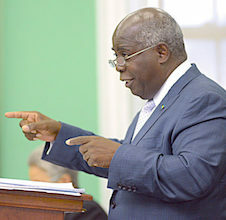 Nassau - Disappointed in the FNM Government's move to enforce a 12% VAT hike on Bahamian citizens, Opposition Leader Philip ‘Brave' Davis strongly cautioned them at a PLP rally to stop taxing the people ‘half to death' as a way of balancing their budget. Davis explained that the VAT increase is really about the government's belief that they can put this tax burden on Bahamians because it would place them in a better financial position for the next three years. Unfortunately, he said this will not work in favour of the people as while they seek to balance the budget, it will only be a certain group who will get to eat the fat of the land as others watch and wither. Davis pointed out that when international pressures came for the former PLP Government to fix numbers to make them look good, they were committed to doubling their investment in education, putting measures in place for a comprehensive National Health Insurance Scheme and charting the course to food security. He said when international pressure came to them to compromise our national sovereignty, the PLP government laid the framework for owning our airspace, saved Bahamar from becoming a ‘ghost hotel' and ensured that more Bahamians became qualified to fill jobs previously held by non-Bahamians.